Keep your drone safe from harm. If you've treated yourself to a shiny new drone recently, please don't fly it in areas where law enforcement agencies are likely to get jumpy at the sight of an unidentified aircraft. An American man has just received a criminal citation for buzzing a drone around the Washington Monument and crash-landing it on the Ellipse, the busy public park just over the road from the President's house. The pilot wasn't arrested but did have his drone confiscated. Authorities say it's the ninth time an unmanned aircraft has been flown in a national park in the Washington area in 2015. The US Federal Aviation Administration (FAA) has already declared Washington, DC a "no-drone zone" and there are similar restrictions in place around other national parks and airports. 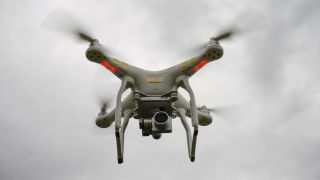 In the UK, the guidelines from the Civil Aviation Authority state that pilots should keep their drones in sight at all times and not exceed a height of 400 feet (about 30 metres). There are other restrictions covering the use of drones with cameras fitted to them. With progress in drone technology accelerating at a rapid rate, the authorities are scrambling to get fair legislation in place to dictate how they can and can't be used. In the meantime, steer clear of places with a heightened level of security - like the White House.